MAGNOLIA, Ark. 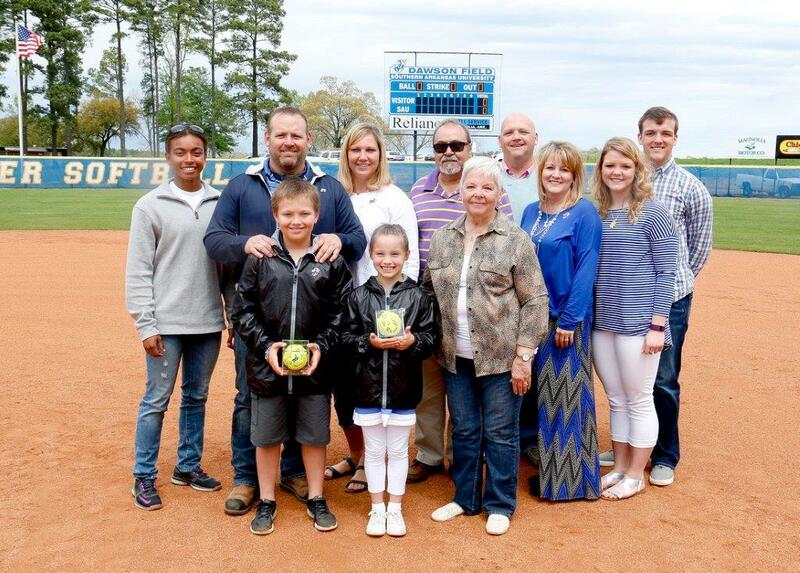 – Southern Arkansas University and its athletic department is pleased to announce that the main playing field at the newly-constructed Mulerider Softball Complex is officially named Dawson Field. A dedication ceremony was held on April 1st. Click here to watch a video from the ceremony. The naming of Dawson Field comes after members of the Dawson Family generously donated the lights at both fields within the complex in honor of their late father, Bill Dawson Sr., as well as their late sister, Melissa Dawson. The field dedication also represents completion of the $1.3 million Mulerider Softball Complex facility project. 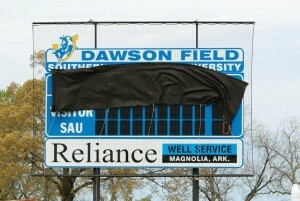 The connection between the Dawson Family, Southern Arkansas University and the town of Magnolia began with the late Bill Dawson Sr. as he spent part of his 33-year coaching/school administration career in Magnolia. In his time at Magnolia High, Dawson captured consecutive state championships for the Panthers in basketball in 1971 & 1972. It is also believed that Bill is one of the only coaches to win state championships in baseball, basketball, football and track and field within the state of Arkansas. 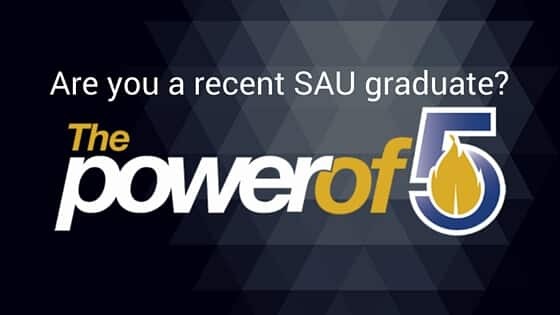 Further strengthening the ties to SAU were Mr. Dawson’s sons, Charlie and Bill Jr. (Billy) as both played baseball and garnered NAIA All-America honors in their time at SAU. Billy, a 1991 graduate of SAU, earned All-AIC plaudits in 1989. That same year, Billy would go on to earn All-District 17 and All-Area V honors en route to being named as an honorable mention All-American for the Muleriders. Currently, Billy is the head football coach at Russellville High School where he completed his first year with the Cyclones. Prior to that, Billy was a three-time state champion football coach at Nashville High School where he went 91-14 in eight seasons. Charlie, a 1996 graduate of SAU, was an All-AIC and All-District 17 player in 1993 &1994. In 1994, Charlie was also named to the All-Southwest Region team as well as earning NAIA All-American honors. Following the 1994 season, Charlie signed with the Atlanta Braves organization where he spent two seasons in their farm system before having a short stint in Independent baseball. Currently, Charlie is the CEO of Geo Surfaces, a licensed Professional Engineering Firm and General Contractor that specializes in the design, development, construction and installation of high performing sports surfaces and sports lighting systems.